I am not a cleaner. Some people clean when they are upset or to help them relax. For me, cleaning is always a chore. I do, however, value a clean house… so cleaning is also always a priority. A couple of years ago I found a house cleaning schedule that changed everything. Suddenly the house always felt clean and the effort it took to keep it that way was minimal. 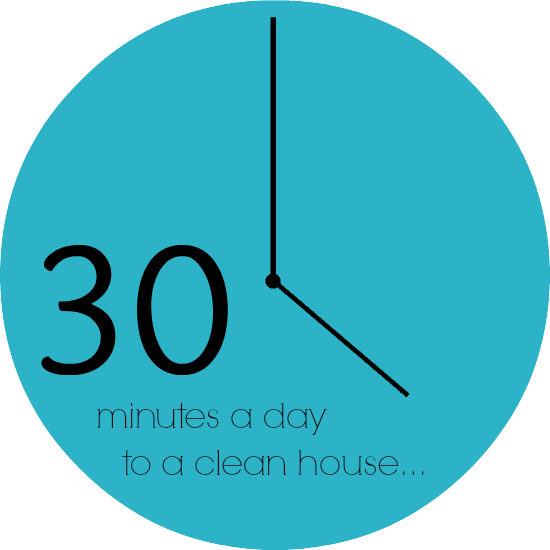 I clean between 20 and 30 minutes a day and my house can be “company ready” super quick on ANY day! It’s so much nicer than cleaning for hours one day a week (the way I used to do it) and I never get that “ugh the house is a mess feeling”. After we moved last fall I reevaluated my system and fine tuned a few things. It’s still going strong, so I think it’s time to share my secret. The Master List. Write a list of rooms to clean. Under each room write a list of what needs to be done in that room and how often. (For instance, you might dust the living room once a week and only clean the windows once a month).I sat in each room while I did this. That was a really helpful way to get a complete cleaning list for that room. You might even include things that you do every six months or once a year. Setting the House Cleaning Schedule. Now write down the days of the week. Make a note for days that you have busier schedules. Make sure to mark one day as a “non cleaning day”.Give each day a room. Tip: If you have more than 6 rooms you can bunch some of them together. I do the bathrooms on the same day since all the cleaning supplies and tools are the same. Another tip: Pick easy rooms (like the laundry room) for days that are extra busy and more time consuming rooms for days that tend to be lighter for you. Put the Plan into Action. I add my house cleaning schedule to my regular to do list at the beginning of the week. Writing the name of the room is enough for me. Then I can refer to the master list to see what needs to be done in that room.One of the awesome perks of this schedule is that it’s flexible within the boundaries. If I have unexpected time to work on cleaning the kitchen, a quick glance at the master list reminds me that it’s been a while since I’ve wiped down the appliances. If I’m short on time it’s very easy to do the bare minimum. The Easy Extras. Every night before heading to bed, we all put away the clutter we have accumulated through out the day. All of the toys have a place, so this is a fairly simple task. Waking up to a clean house is such a beautiful thing! Of course this routine works better when my house is organized and things have a place to go. 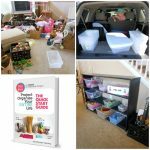 Thanks to Project Organize Your Entire Life getting (and staying) organized was a breeze! Since the time when I first read this eBook, the Modern Parents Messy Kids team has created a Printables pack to accompany the eBook. EVEN BETTER! I am a proud affiliate of Project Organize Your Entire Life. This post contains affiliate links, thank you for supporting A Mom with a Lesson Plan. Do you have a house cleaning schedule in place already or are you desperate for a change? I find cleaning a chore too. I am going to try this! This post was soooo helpful as I HATE cleaning! lol 30 minutes is definitely feasible and I actually started putting this in action the very next day!! 🙂 God Bless! Love this simple easy article that will help all moms (and anyone for that matter) keep their home clean on a daily basis! I agree on picking up the toys every night and that everything has a place. It’s a work in progress with my kids so we will continue practicing that. I also like clearing out all the clutter from our couch every night, fixing our throw pillows and cushions (the kids play with them all the time), and putting throw blankets back into place, etc. It’s the little things each day that can help so cleaning doesn’t feel like such a chore! Thanks again for sharing these tips! 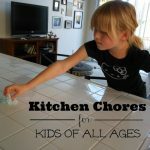 What do you do when you have a messy adult in the house that messes things up you just cleaned? ?